The report comes after fast food workers across the country have for months been staging protests and walkouts over low wages. Many would like to see wages raised to $15 an hour. The median wage for the workers in the report was $8.69 an hour, and the workers were employed for a median of 30 hours a week. The figures are in 2011 dollars. Sylvia Allegretto, an economist with Berkeley’s Center for Labor Research and Education and one of the report’s authors, said workers in the restaurant industry are especially likely to be enrolled in one or more government program. 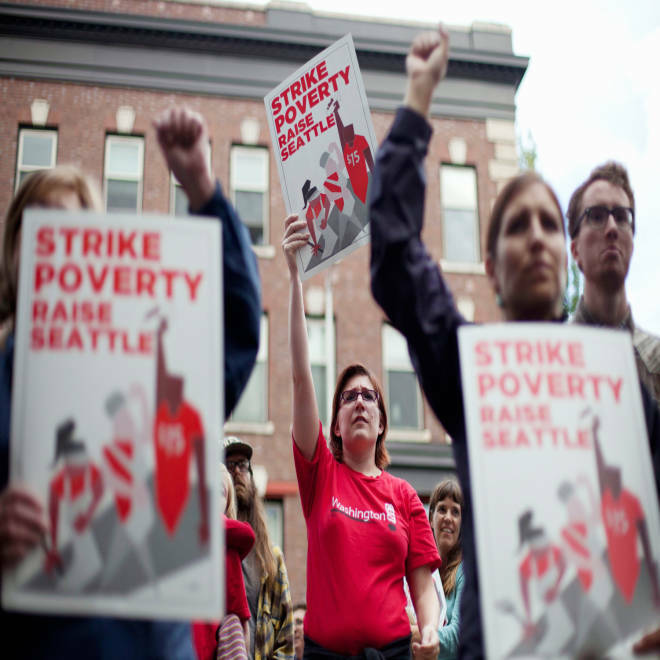 But, she said, the findings are indicative of the broader challenges many low-wage workers are facing in trying to make ends meet without extra help. She noted that most recipients of the major government programs they looked at are in a household in which at least one person is working. “We have this problem in general of working poor,” she said. The National Restaurant Association, a trade group for the restaurant industry, released a statement criticizing the report as misleading. It said that nine out of 10 salaried employees started out as hourly workers. “America’s restaurant industry provides opportunities for millions of Americans, women and men from all backgrounds, to move up the ladder and succeed," Scott DeFife, the association's executive vice president for policy and government affairs, said in the statement. The U.S. job market has generally seen a shift away from highly paid manufacturing jobs and toward growth in lower-wage leisure, hospitality and retail jobs, as well as health care, said Paul Ashworth, the chief North American economist with Capital Economics. He was not involved in the study. That, combined with a weak economy, has meant that median household incomes are back to the same levels the nation saw in the mid-1990s, after adjusting for inflation. But with the U.S. facing stiff global competition, Ashworth noted that there are no easy solutions. “You can’t deny what’s happened to real median household incomes, but the question beyond that is well, what do you do about that? Are we advocating rolling back globalization and raising trade barriers and making the U.S. more isolationist, where you can only buy American-made products?” Ashworth said. The report released Tuesday used state and federal government data from between 2007 to 2012 to get a picture of how fast-food workers fared in different economic periods. They focused on nonmanagerial fast food workers who had worked at least 11 hours a week for 27 or more weeks per year. Many people think of fast food work as a job for teenagers, but the report found that many people holding those jobs were adults. About 23 percent of the workers were teens ages 16 to 18, compared to about 26 percent of front-line fast food workers who were adults with children of their own. About half were adults with no children.